Since the introduction of the Patek Philippe Nautilus 5711/1A in 2006, the watch has reached a mythical status. Especially during the last few years, it seems this watch has been picked up by a larger audience than ever before. With a retail price of 26.810,- Euro, not an easy sell for an all stainless steel watch with no complications other than a date. Wrong! These watches have a long waiting list today, and a pre-owned Nautilus 5711/1A is not a cheap alternative with prices starting at around 40.000,- Euro. It is the watch craze we live in today I am afraid, but it has gone to extremes with the Nautilus. This article is a comparison between the Nautilus 5711/1A and the vintage 3700/1A. An article I already published in 2013, when the prices were below today’s list price of the 5711/1A. A lot has changed in the past five years, you could say. But what didn’t change, is the magnificent story about the Genta designed Nautilus and the amazing finish of the case and bracelet on these watches. Where this article used to be a comparison to help you make a decision between the 3700/1A and 5711/1A, it is now purely informative about the differences and similarities between these two references. The prices of the 3700/1A went up from approx. 20.000,- Euro in 2009 to a staggering 70.000 Euro in 2018. But let’s put the value development of the Nautilus aside for a while, and talk about the steel luxury sports watch that Patek Philippe introduced in 1976 and then re-introduced in 2006. Patek Philippe is being regarded as one of the most prestigious watch companies from Switzerland. This always has been the case. Their – often – wealthy clients are located all over the world and among them are royals and captains of industry. It is a brand with one of the best-known slogans, “You never actually own a Patek Philippe. You merely look after it for the next generation.”. Whether this is true or not, does not matter, owners of a Patek Philippe watch or future buyers of a Patek Philippe watch gladly refer to this slogan to justify their expensive timepiece. In the mid-1970s Patek Philippe is famous for their high-quality watches with complications or the flat gold dress watches, decided to manufacture a luxury sports watch. A few years earlier, in 1972, Audemars Piguet showed with their Royal Oak watch that an Haute Horlogerie brand could actually get away with a luxury sports watch in stainless steel. Patek Philippe hired the same man who was responsible for designing the Royal Oak, Gérald Genta. Genta designed a watch with very specific characteristics, such as the porthole design, the combination of polished and satin-brushed parts on the case and bracelet and – of course – the integrated stainless steel bracelet. All was done with the highest possible grade of finish. In 1976, Patek Philippe introduced the Nautilus to the public. A large part of the Patek Philippe clients did not like the Nautilus. A sports watch did not make sense for a company like Patek Philippe, who always had their focus on classic shaped (gold) timepieces with – or without – complications. The Nautilus became the enfant terrible of the collection and it actually still is. People who are in the market for a Patek Philippe Nautilus tend to make the decision between a brand new Nautilus from the actual collection or buying a pre-owned vintage Nautilus from the mid-late 1970s. When it comes down to the price tag, a pre-owned vintage model is as expensive (or sometimes even more expensive) than a new one. This article zooms in on the very first Patek Philippe Nautilus, by the reference of 3700/1A, and the current Nautilus, reference 5711/1A. On the first hand, nothing much seems to have changed in the last 36-37 years, but if we take a closer look, we are able to see what has happened to the watch. The case of the Patek Philippe is designed like a porthole. The ref.3700/1A model consists of two parts basically, the case and the bezel. The bezel and case are screwed to each other, like a porthole. The case of the 3700/1A Nautilus measures 42mm in diameter, especially for 1976 a considerably large case. It was soon nicknamed Nautilus Jumbo. When Patek Philippe re-introduced the Nautilus (5711/1A) in 2006 (it then retailed for 14.600,- Euro), about 30 years after the introduction of the Nautilus model, the case had become a bit bigger. The new – or current – case measures 43mm and is a little bit thicker. The ref. 5711/1A also has a three-part constructed case. Besides the bezel and case construction, the case back is now a separate part. According to purists, the two-part construction of the 3700/1A is a bit more interesting as it captures the essence of the porthole design. Another aspect that had an effect on the appearance of the case was the use of a new movement (more about that later) or better said, Patek Philippe decided to add a seconds hand to the new reference. The placement of a seconds hand had quite some effect on the appearance of the watch, as the upper part (or bezel) became a bit thicker as well. Gérald Genta probably had a weak spot for the hour and minute-only watches, as the original Royal Oak was also a watch without a seconds hand. The dial of the Nautilus also changed in appearance if we compare the 3700/1A to the 5711/1A. Although the pattern on the dial remained, the colour of the dial changed. The new Nautilus dial is a bit more ‘electric’, as the green/blue colour changes a bit when you rotate the watch towards and from the light. The 3700/1A Nautilus remains to have the same blue-ish dial colour, no matter from what angle you will observe it. The wording on the dial ‘Patek Philippe’ and ‘Geneve’ has moved a notch towards 12 o’clock and the font changed as well. The typography of the Nautilus 3700/1A fits the 1970s style and is a bit bold compared to the current model. If you look at the hands, you will immediately notice the ‘seconds’ hand on the 5711/1A as opposed to the two hands dial of the 3700/1A. It is a matter of taste and convenience probably, but the dial of the 3700/1A appears to be more soothing. When the Nautilus was introduced, Patek Philippe used the mechanical automatic winding movement calibre 28-255C. This ultra-thin movement was based on Jaeger-LeCoultre calibre 920 movement and therefore the same movement as used in the Audemars Piguet Royal Oak reference 5402 of 1972. 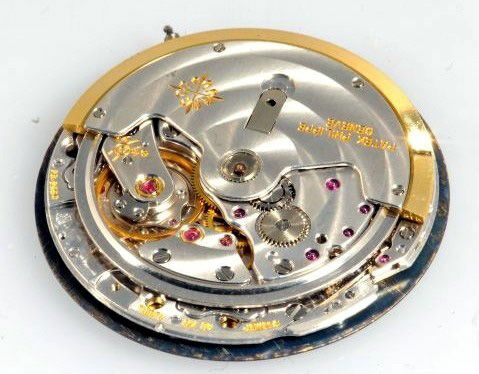 This movement, now only being used by Audemars Piguet as calibre 2121 (and Vacheron Constantin uses their own version it in their Overseas Ultra-Thin), is only 3.05mm in height (including rotor) and does not feature a second hand. The rotor uses rails to roll on instead of ball bearings. The Nautilus 5711/1A has a mechanical automatic winding movement calibre 324 S C inside. In-house developed and manufactured by Patek Philippe. A beautiful finished and constructed movement, but not as flat as its predecessor. Also, as you can see on the pictures below, the movement is visible through the case back on the current Nautilus model. 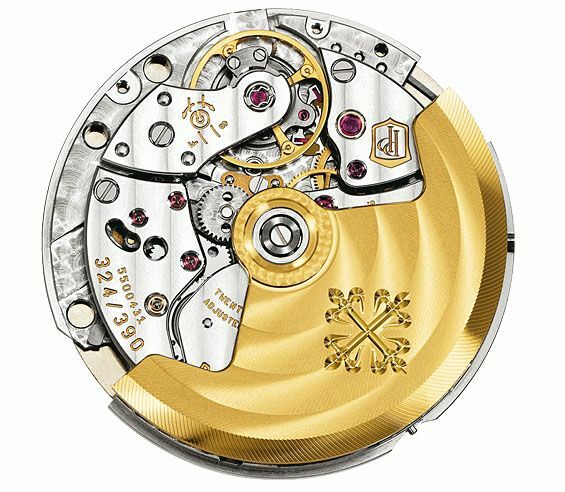 Because of the three-part constructed case, calibre 324 S C movement, the appearance of the 5711/1A is a bit different from the 3700/1A model. It is thicker, it has more space between dial and sapphire crystal (due to the second hand) and has a transparent case back. However, Patek Philippe succeeded in maintaining the sleek and elegant design of the Nautilus. Although many sports watches feature a thick and solid feeling bracelet, these Nautilus bracelets are very thin and sleek. In wearing, there is almost no difference between the bracelet of the 3700/1A and the new 5711/1A. The main difference is in the folding clasp as you can see in the photos. The 3700/1A bracelet has quite a simple folding mechanism, two pieces of metal with no specific finish or engravings. It does the job though. For safety reasons, there is a flip lock on the clasp as well, to make sure the folding clasp can’t open by accident. The new 5711/1A bracelet has a double folding clasp and a flip lock. The double folding clasp looks much nicer of course and fulfils the requirements of the modern luxury watch. Both bracelets have the Patek Philippe logo engraved in the flip lock. Today, the difference in price between the vintage Patek Philippe Nautilus 3700/1A and the 5711/1A is bigger than ever, so it has mainly become a matter of resources or budget. That said, you can’t go wrong with either of these watches, there are some differences in the construction of the case, movement and dial that might trigger the purist to go for the Nautilus reference 3700/1A. If you admire the Nautilus design, heritage and perfect Patek Philippe-finish but you don’t have the resources for it or don’t want to have the worries about it being vintage, you might want to go for the modern Nautilus 5711/1A. Find below an overview of the value development of the Nautilus references that I recently wrote for Chrono24’s magazine. *This article originally appeared on Fratello on May 23rd, 2013, but has been updated with new facts, information and images on September 29th, 2018.